I got into the training industry by accident. The company that hired me did so because I was a subject matter expert in the area they needed to deliver training. They sent me on courses to learn the skills and knowledge required to be an instructional designer, and I’m forever in their debt. I found what I was meant to be doing. When I decided to go freelance, I knew that becoming well known for my knowledge and skill would help me get new clients. I had worked as an instructional designer for two companies for over nine years. Only a handful of people knew that online learning design was something I had a talent for. I attended a few webinars online with Anita S Horsley, and I got to know her a little. I saw that she was a frequent speaker at the Adobe Learning Summit in Las Vegas. My initial thought was that I would love to be a speaker at Adobe Learning Summit, but all these speakers were people with masters degrees in education, and some were even PhDs. I was just a guy who knew how to do some stuff in Adobe Captivate. Through Anita, I made contact with the folks at Adobe. Their initial reaction was lukewarm until they realized that I was the guy making all these YouTube videos. They invited me to be a speaker at the first eLearning Conference in Washington D.C. I remember showing up at my first Adobe eLearning Conference in 2016. To say I was nervous would have been an understatement. My topic was Test and Track with Adobe Captivate 9 with Adobe Captivate Prime. I had my little PowerPoint presentation which I thought was so amateurish, and I just hoped that I would be able to hold it together to get through the one-hour session. The conference was a great success. My session went well, and many people recognized me from my YouTube videos. To date, I have been invited back an additional six times. Each time I participate in these live events, I get a little bump in business. I get home to more requests for training or design jobs than is normal for me. Since that time I haven’t looked at my role in this industry the same. You can have all the education in the world, written scholarly articles that theorize about where modern learning trends are heading. What matters is your ability to create effective training. I no longer get nervous when I present at conferences because I didn’t spend all those years at a college earning a fancy diploma. Now I get nervous for other reasons, but I have confidence in the material I deliver. Remember you aren’t born an online learning expert. It’s something you have to work at. It takes time, and you will make mistakes, but in the end, anyone can do what I and others do. There is nothing special about any of us. We just put in the work. The post Everyone Has a Voice appeared first on eLearning. You’ll notice that the Las Vegas event is scheduled for October 2nd and is priced at $499. The regular price of the Adobe Captivate Specialist Certification Program is $799. The only time it’s less expensive is when it coincides with an Adobe eLearning live event such as the eLearning Conference in Washington DC or the Learning Summit in Las Vegas. You can’t keep a secret from me. Knowing that the Adobe Learning Summit is in early October means you have some work to do to get ready. You’ve got six months or so to post 50 video tutorials, blog posts, or demo projects created in Captivate. Accumulate the points needed and not only can get Adobe Captivate for free for 12 months but you could be going to Vegas for free as well. The Adobe Learning Summit 2019 would be my eighth Adobe Live event that I’ve attended for no cost to me. I’m looking forward to seeing all of you there as well. The post Breaking Captivate News! appeared first on eLearning. The post eLearning Livestream – Adobe Captivate Upcoming Update & AMA | March 18, 2019 appeared first on eLearning. The post Making Conferences More Affordable appeared first on eLearning. Attend the Training 2019 Expo as Adobe’s Guest! Feel like heading to Orlando? Would you like to attend Training Magazine’s Training 2019 Expo as Adobe’s guest? We invite you to join us on Monday February 25 & Tuesday, February 26 at Disney’s Coronado Springs Resort. Free parking is available for Training 2019 attendees. Visit Adobe’s booth (we’re #201) and check out the Second City Expo Stage, VR/AR Demos, Training Technology Test Kitchen and much more! Register for a complimentary Expo-Only badge ($20 value) by entering Discount Code: EXEX. Click here to register. The post Attend the Training 2019 Expo as Adobe’s Guest! appeared first on eLearning. I completed the Adobe Captivate (2019) Specialist certification in Las Vegas this past fall. But, before I even got to Nevada, the learning experience had begun. The registration process for the Adobe Captivate Specialist certification course in Las Vegas, Nevada was relatively straight forward. I went online, paid the $499 USD fee and was registered to both the course and the one day co-located Adobe Learning Summit. Even when paying with Canadian dollars, the price seemed very reasonable. Meanwhile, I had never been to Las Vegas and thought it would be a great opportunity to combine business with pleasure. Two weeks prior to the face-to-face training in Las Vegas I received an email giving me access to Adobe Prime and the Adobe Captivate Specialist Certification course. When I got into the course, what I found was a series of videos – 20 in total. 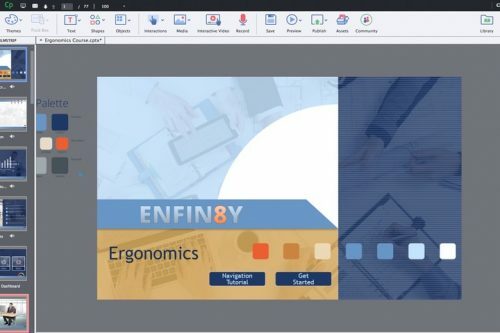 There were also a set of Captivate 2019 projects that I downloaded using the trial 30-day Adobe Captivate subscription that I had set up in advance. The videos and the Captivate projects were mostly the “Enfin8y – Ergonomics” project (pictured). The whole of it seemed intense. But with some planning, I knew I could get in done in time for the face-to-face training in Las Vegas. Or, so I hoped. Once I started playing the videos I grasped the volume of work ahead of me. Although it was a total of seven hours of video, each video included a practice activity. Essentially, you re-create the “Enfin8y – Ergonomics” project step-by-step. While learning by doing is excellent pedagogy, the reality of it translated into about 30 hours of work. I would watch the video and with my free trail subscription, would complete the associated activity. Back and forth between playing the video, doing the activity and replaying the video it went. Meanwhile, the time to board my flight to Vegas loomed. Near the end of the allotted two weeks I played the very last video of the pre-training. It was a total of 3 minutes. Short and sweet. The online instructor, who’s voice had become synonymous for me with the certification process, wished us good luck with the exam. I thought with a little dismay, “Would I be ready?” I could feel the test anxiety tightening in my chest. After 30 hours of training I believed I was probably prepared but that I’d only just scratched the surface of this incredibly comprehensive software. Meanwhile, the pre-training was done and dusted. I was ready as I would (n)ever be. I could only hope that the work I’d done had been enough. Get started with the online training right away and plan your time. Download a free trial version of Adobe Captivate 2019 or get a full subscription. Build in time to reflect on what you are learning. Rushing and cramming will make it challenging to retain what you have learned. The post Details of the Adobe Captivate (2019) Specialist Certification experience: Getting started – Part 1 of 3 in a series appeared first on eLearning. Power up your professional profile and stand out with the industry-leading Adobe Captivate Specialist recognition. Learn from the best in the business how you can unlock the potential of Adobe Captivate to create brilliant eLearning courses. Successfully complete the online assessment, get endorsed as a Specialist, and earn a certificate and badge for use in your professional and social networks. The Adobe Captivate Specialist is a full-day certificate classroom program, delivered by top Adobe Captivate experts. You will be enrolled into the course as soon as you register and will receive course instructions and prep materials two weeks prior to the on-site program date. One the day of Certification, you will join other members in the classroom training. Following the training you will complete an online assessment – upon successful completion, you will receive your Adobe Captivate Specialist certificate. By the end of this program, participants will have mastered all the major workflows in the latest release of Adobe Captivate – ranging from creating storyboards, to designing static and responsive courses, building custom animations, using advanced actions and eLearning assets, and more. All participants are required to bring their own laptop computers with Adobe Captivate (2019 release) pre-installed (if you do not already have the 2019 release you can download a free trial within 30 days of the program). Those without the 2019 release will NOT be able to complete or pass the assessment. The demo files and assets will be emailed to you two weeks prior to the classroom session. These must be completed and reviewed before the on-site classroom session. The standard price for the full-day program is $499 USD. Payment is required for admittance into the program. If payment is not received, your entry will not be permitted. This program is non-refundable. Under no circumstances will refunds be issued. The price covers the registration fee, food and beverages for the day, and the certificate and badge if the assessment is successfully passed. *Federal Employees, if you would like to register for this event and cannot submit payment online. The post Adobe Captivate Specialist appeared first on eLearning. The Complete Learning Technologist Certificate – Coming to Orlando in February! I’ve wanted to put together a learning technologist certification for a long, long time. Well, guess who had the same idea – Training Magazine! And they’re making it happen at Training 2019! Learning geeks will unite in Orlando for our three-day learning technology program February 22-24, 2019. You can register here. I’m going to cover a variety of technologies on day three, in addition to discussing how to select and implement educational technology. And I’ll give you some free goodies to take home with you. Take a look at the program descriptions below and consider joining us at Disney’s Coronado Springs Resort! Whether you are a designer, developer, manager, facilitator, administrator, or executive, you need to understand what learning technologies are capable of today—and what their promise is for tomorrow. Through demos, hands-on experience, checklists, and rubrics, this program goes beyond identifying the latest shiny training tech objects — and helps you become a well-rounded learning technologist who makes the optimal selection, design, and implementation decisions for your organization. About the basics of course authoring, regardless of what authoring tool you may be using. How development principles apply to current off-the-shelf tools like Adobe Captivate and more. How to make the appropriate selection for authoring tools. How to learn any new authoring tool. Architecting your next project with collaborative tools. Sketching a storyboard from paper to PowerPoint. Improving brainstorming and feedback loops. Creating a prototype with Marvel app. Using Explain Everything App to create animated explainers and promos and to provide feedback. Thinking Outside the Box: 5 activities and concepts to add to your next project. Building an interactive chatbot for learning. Strategies for designing for learning and your audience. Define common types of learning technology platforms. Demonstrate how technology can help you engage learners through the use of gamification, mobile learning, social learning, and blended learning elements. Explain how to use reporting and analytics to understand the learner experience. Describe the process to select a new technology platform, including the features and factors you should review with potential vendors. Discuss the process of successfully implementing and maintaining a learning technology platform. Cover best practices that include how to internally market your platform, curate your course catalog and content, and build an effective administrator team. BONUS! You will walk away with supplemental materials and a free trial of Adobe Captivate Prime. BYOD: Please bring a WiFi-enabled laptop with Storyline and Captivate installed (trial versions okay). The post The Complete Learning Technologist Certificate – Coming to Orlando in February! appeared first on eLearning.